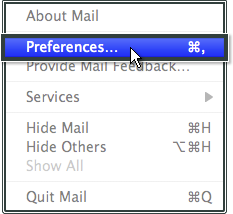 From the top bar, click Mail, then click Preferences. Click Accounts at the top of the new window. Click the + icon at the bottom-left of the window. Fill in the Full Name field. Your full name will be visible to the recipient(s). Fill in the Email Address field. This will be the email address you have created in the One.com Control Panel. Fill in the Password field. 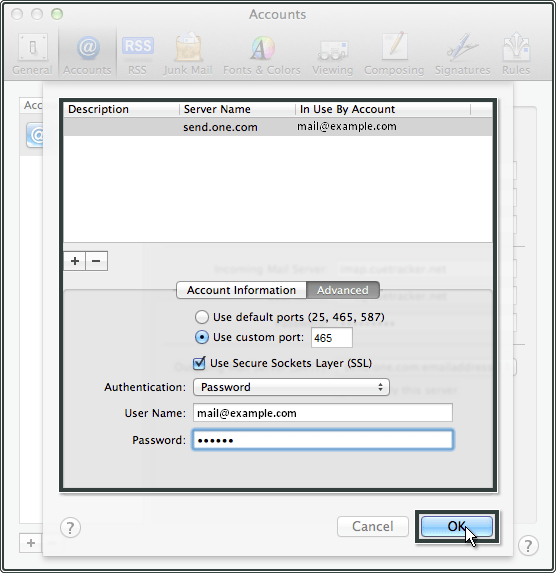 This is the password you set when you created the email address in the One.com Control Panel. Click Continue. 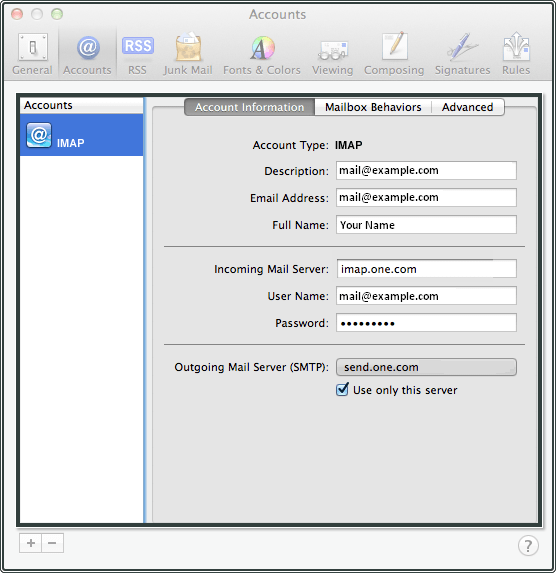 From the Account Type menu, select IMAP. Enter a description for the Description field, which will help you recognize the account. 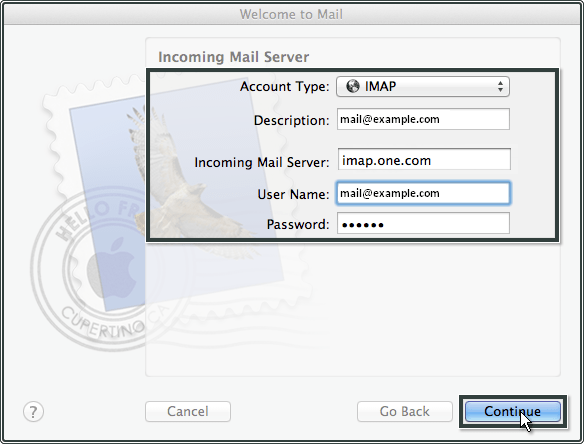 In the Incoming Mail Server field, type in imap.one.com. Fill in your email address in the User Name field, and your password in the password field. Make sure Use Secure Sockets Layer (SSL) is checked, and that Password is selected from the Authentication drop-down menu. Click Continue. 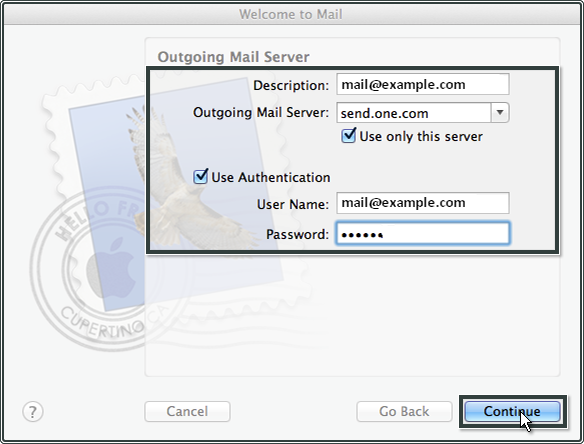 In the Outgoing Mail Server field, enter send.one.com. Make sure Use only this server is checked. Make sure Use Authentication is checked. Fill in your email address in the User Name field, and your password in the Password field. Click Continue. Check if your details are correct. If so, make sure Take account online is checked, and click Create. 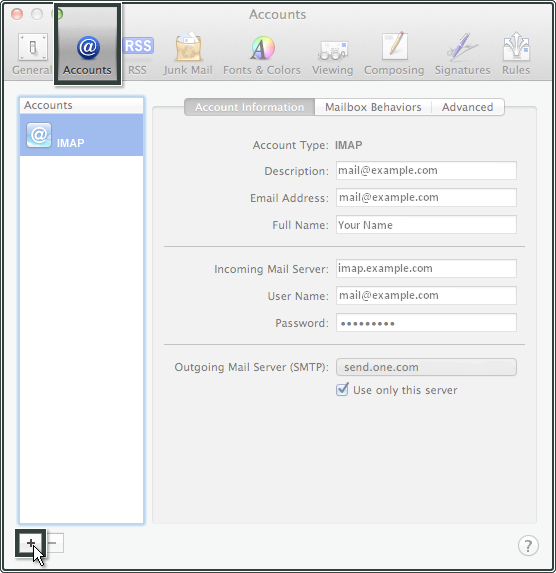 Return to the Accounts screen by clicking Mail, Preferences, Accounts. 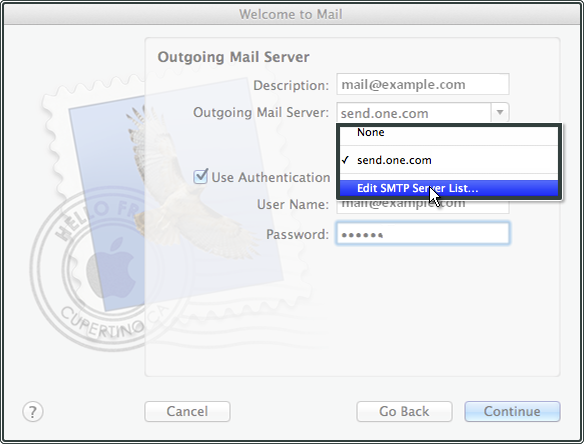 Make sure Server Name send.one.com is selected and click the Advanced tab. Select Use custom port, and fill in 465. 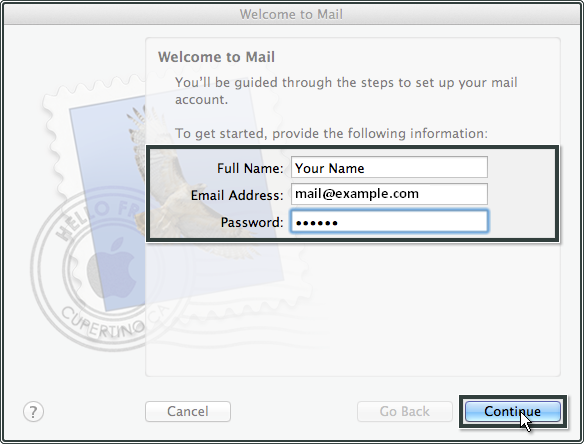 Make sure Authentication is set to Password and that User Name is set to your email address. The Password is the one you chose, when you created your account in the Control Panel. Click OK and close the Accounts screen. 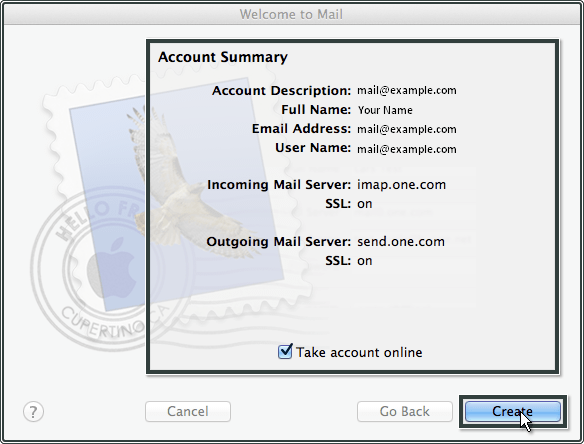 You have now set up your email account in OS X Mail. Make sure Use Secure Sockets Layer (SSL) is checked, and that Password is selected from the Authentication drop-down menu. Click Continue. 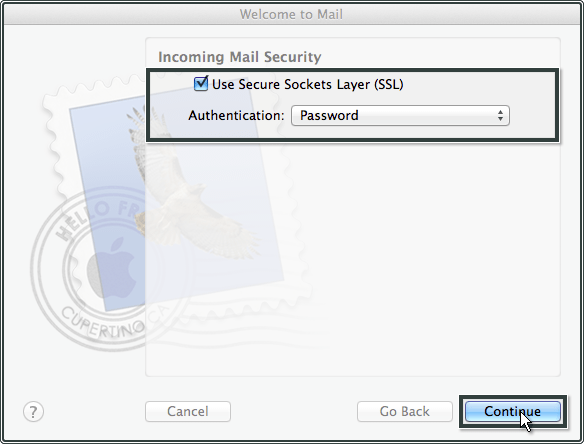 Make sure that IMAP Port is 993 and that the checkbox Use SSL is checked. You can find these settings in the Advanced tab.